Prime Minister Sheikh Hasina has expressed her firm conviction that Bangladesh Army would make important role in public welfare activities side by side continuing country's democracy and constitutional rule. "Bangladesh Army acquired love and affection of the countrymen through their services and dutifulness. Their services for welfare of the people would also continue in future," she said. The Prime Minister was addressing a colourful parade on the occasion of giving National Standard Award to the Corps of Military Police (CMP) Center and School at Savar Cantonment on Thursday. 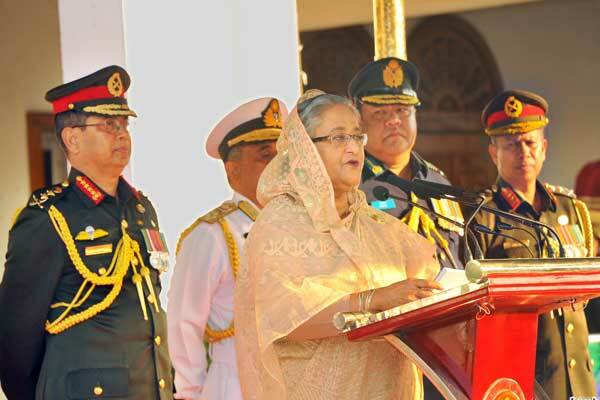 Sheikh Hasina said Bangladesh Army has emerged as a disciplined and modern force in the world arena and modernization and training for enhancing professional excellence of the force would continue in future. "Bangladesh Army which is radiant with the spirit of the Liberation War, is a symbol of confidence and pride of the nation. They are devoted to accomplish any task in need of the nation side by side protecting the country's independence and sovereignty," she said. Army Chief General Abu Belal Muhammad Shafiul Huq and GOC of Army Training and Doctrine Command Lt. General Aziz Ahmed received the Prime Minister on her arrival at the parade ground. Smartly turned out contingents of the parade gave salute to the Prime Minister. Later She inspected the parade. Cabinet members, PM' Security Advisor Major General (retd) Tarique Ahmed Siddique, chief of Bangladesh Navy Admiral Nizamuddin Ahmed, parliament members, foreign diplomats, senior military and civil officials and serving and retired officials of the CMP were present. The prime minister handed over the National Flag to Senior Warrant Officer Abdul Aziz. On the occasion the Prime Minister also inaugurated newly constructed CMP Centre and School Complex. The prime minister said her government has attached importance to modernization of the CMP Centre and School. In view of this a complex has been constructed equipped with modern facilities for international standard training and administrative capacity. Two new Military Police units were constituted while the rank of the MP unit has been elevated to Lieutenant Colonel from Major. The units are being equipped with modern technologies and transports, she said. Sheikh Hasina expressed her firm conviction that newly constructed CMP complex and use of the modern technologies would help the members of the corps in achieving more successes in imparting training and establishing it as a reputed organization in the world. Shekh Hasina said the Military Police Corps are working with devotion and sincerity to establish discipline in the army, and since its inception the organization is providing training to the members of the air force, navy, coast guard, BGB, Ansar and department of prison alongside members of the friendly countries. "Getting the National Standard Award is an outstanding recognition to the services of the CMP and the award would certainly inspire the members of the corps to work with more devotion and sincerity," she hoped. Sheikh Hasina said Bangladesh is now a brand name in the UN Peacekeeping Missions, which is a matter of great pride for us. Members of the Bangladesh Armed Forces are bringing honour and dignity for the nation through their immense sacrifice, dutifulness and professionalism during discharging their duties in peacekeeping missions. Pointing out the steps taken by her government for development of the armed forces, the Prime Minister said Father of the Nation had begun the task of building a strong force after independence and in 1972 he created the first Military Police Unit. In the hands of the Father of the Nation, she said, the 'Corps of Military Police' was constituted in 1974 with four military police units. Bangladesh Army is now known as a disciplined and modern force beyond the national territory. Sheikh Hasina said Father of the Nation through his 23 years struggle liberated the country to build a happy and prosperous nation. After independence Bangabandhu had devoted himself to build up the nation with the help of the people of every class and profession. Within three years of independence, Bangabandhu had taken the country to the path of progress. But the anti-liberation force killed him brutally, smashing the nation's hopes and aspirations, the prime minister said. Sheikh Hasina said Bangabandhu formulated a defense policy in 1974, suiting to an independent and sovereign state. In light of the plicy, she said the Awami League has formulated the 'Forces Goal- 2030' aimed at building a modern, time befitting and strong armed force. Sheikh Hasina said reformation and changes as well as acquisition of sophisticated armories are going on to build it as a world standard force. New infantry divisions were raised up in Sylhet and Cox's Bazar. Work of formation of another infantry division in Lebukhali of Barisal would be completed soon. Highlighting the country's progress during the tenure of her government the Prime Minister said Bangladesh is now on the highway of development, making it a role model of development in the world. Bangladesh is now one of the five countries of high economic growth. During the last eight years, she said, extreme poverty has reduced to 12 percent from 24.23 percent while overall poverty has been declined to 22.4 percent from 41.5 percent in 2005-2006. Around one crore people have found their job and five crore people came out from low income to middle income group, she said. Sheikh Hasina said her government has undertaken some fast track projects to bring rapid changes in the country's economy. Works of the Padma Bridge, deep sea port, nuclear power plant, coal-based power plant, metro rail project, trans boundary rail network, LGN terminal, Bangabandhu Satellite and a tunnel under the Karnaphuli River are going on full swing, she said. The Prime Minister appreciated the services of the armed forces in providing assistance to the displaced nationals of Myanmar as they have taken shelter to Bangladesh to evade intimidation of the government. She hoped that her government is making constant diplomatic efforts to resolve the problem with the help of the international community. After the parade the Prime Minister joined a lunch with serving and retired officials of the CMP.